Columbus expats, now ensconced in NYC, Huntertones live that motto to its fullest. Not only does the band tour extensively, they make time to teach, absorb, and learn from their experiences. Those years of intensive travel imbue their most consistent, focused, and pleasurable album, Passport. Huntertones return to Columbus’ historic Lincoln Theatre on April 5, 2019, at 8:00 pm (tickets and more info here). That’s plenty of time to absorb this rewarding, joyful new album. Our thoughts about the album and official music videos are below. Huntertones have always brought a keen sense of place to their music: the first song of theirs that made a strong impression on me was an ode to the Cleveland institution “Hot Sauce Williams.” Co-producing with Banda Magda leader Magda Giannikou and working with mixer Nic Hard (Snarky Puppy), Huntertones bring that specificity to these tunes, not just window dressing or ambiance. “Change” feels like the record’s thesis statement; showing everything the band has learned and how everything fits together. The piece opens with glowing cells that recall Steve Reich and Philip Glass. It soon shifts into an easy-going ‘70s funk, studded with rhythmic curve balls and excellent playing from saxophonist Dan White and trombonist Chris Ott. 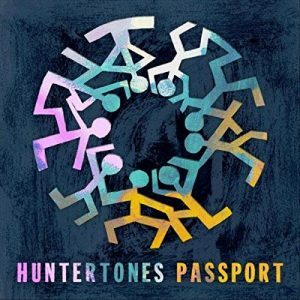 Huntertones choose their handful guests well and use them brilliantly on Passport The band’s collaboration with Hope Masike, “Hondo,” is a gem. Led by Masike’s beautiful vocals and mbira melting around and flowing through an infectious melody, the band finds a tone like dappled sunlight. Jon Lampley’s trumpet taps a vein of purity I’m not sure I’ve ever heard from him on record; he shadows, sweetens, and underpins the vocal without ever overpowering it. “Fergal’s Tune” features the jaunty, nuanced violin of Fergal Scahill (We Banjo 3). That violin line, coupled with a showcase for Chris Ott’s beatboxing and Lampley’s head-nod sousaphone makes it the most typically “jam band” tune on the record but it resolves as a sweet, concise pop song at 3:12. Passport is rich with moments of subtle, surprising drama. Josh Hill’s slashing guitar imbues the simmering “Star of the East” with a fist-pumping, anthemic shine. Hill and pianist Justin Stanton lead “Change” into roller-coaster emotional shifts, leading to its dramatic conclusion of wordless vocals that remind the listener just how strong and close the vocal quality of the three-horn front line has grown.